Established in 607 A.D. by Prince Shotoku, a vigorous supporter of Buddhism, Horyuji Temple was inscribed on the world heritage list in 1993 as the oldest wooden structure in the world. Various national treasures representing Japanese Buddhist art are displayed, such as the statue of 'Kudara Kannon' in the Kudara-Kannon-Do Hall of the DaihoZoin treasure house. The precinct is divided into the West Precinct and the East Precinct. In the former are structures of the Asuka Period or 8th century, such as the five-storied pagoda and the Kondo Hall. "Tamamushi-no-Zushi," a Buddhist alter of the Asuka Period, Yumechigai Kannon statue, and other temple treasures are also found in this Precinct. The Tamamushi-no-Zushi, is decorated with the wings of jewel beetles laid under the metal openwork. In the East Precinct is the Yumedono, the eldest octagonal hall in Japan. "Guze Kannon" a life-sized wooden Buddhist statue of Prince Shotoku is kept here. The statue is open to the public from mid-April to mid-May and from mid-October to mid-November. Take bus No. 52, 97 or 98 from JR Horyuji Station and get off at Horyuji Mon Mae. Exclusively for nuns, this temple is said to be rebuilt from the former home of the mother of Prince Shotoku, who designed Japan's first constitution, comprising of 17 articles. A sitting statue of the Mirokubosatsu, or divine savior whose mission is to relieve people's suffering, has been designated as a national treasure. It is made of Japanese cinnamon wood and dates from the 6th century. With its right leg resting on the left knee and the right hand raised to the cheek, Mirokubosatsu has a noble figure and gives a delicate but beautiful smile. The oldest three-storied pagoda in Japan. 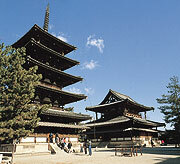 The three-storied pagoda, approx. 24m in height is the oldest, and also the largest of its kind in Japan and has been registered as world heritage. It was established in 706 A.D. The statue known as "Juichimen Kannon" or Boddhisattva (divine Buddhist savior) with eleven faces (ten on top of its main face), has been designated as an important cultural asset. Take bus No. 60 or 63 from JR Oji Station and get off at Hokijiguchi. A 10-minute walk from the bus stop / Take bus No. 50 or 97 from Kintetsu Koriyama Station and get off at Hokiji Mae. Prince Shotoku's achievements include the establishment of Japan's first "Kan Junikai" system, a merit based promotion system irrespective of social class. It is said that this temple was built by his son Prince Yamashiro no-o-e, who prayed for Prince Shotoku's recovery from illness. "Yakushinyorai," "Kokubosatsu" and other fine Buddhist statues, divine saviors of the present suffering of mankind, are located there. Home to the world's largest papier-tiger. Located halfway up Mt. Shigi (437m above sea-level), this temple is popular for its "Bishamonten" statue, a deity of money, virtue and luck. Many worshippers visit the temple every day, irrespective of whether a special ritual is held or not. Smaller versions of the world's largest papier-tiger are a very popular souvenir of Mt. Shigi.